The World Bank should be ambitious in working toward clean energy approaches in its development strategies, but it would be a mistake to definitively rule out coal in all circumstances. 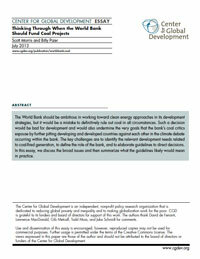 With appropriate policies and procedures in place, the World Bank and other multilateral development banks are in the best position to help poorer countries seek out alternatives to coal, to build and refurbish only the coal-fired generation that is needed, and to do so with the highest degree of environmental and social safeguards. The key challenges are to identify the relevant development needs related to coal-fired generation, to define the role of the bank, and to elaborate guidelines to direct decisions. In this essay, we discuss the broad issues and then summarize what the guidelines likely would mean in practice.